The weather’s still a bit chilly to think about going to the beach, let alone catching a wave on a surfboard, but a couple of shows in east TO tonight will give what feels like a holiday weekend (you can bet a lot of people called in sick after yesterday’s celebrations) a definite proto-summer feel. 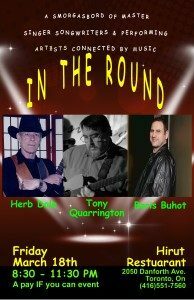 If you have fond memories of campfire-style song circles with earnest songwriters sharing their tunes then the 9-12 “In The Round” show at Hirut Café, on Danforth Avenue will definitely appeal to you. Host Boris Buhot welcomes two venerable, close-listening worthy fellow songwriters: Juno-winning guitarist, arranger, accompanist, composer and singer Tony Quarrington; and down-to-earth avuncular Country ditty-crafter Herb Dale. The small venue at 2050 Danforth Ave., around the corner from the Woodbine subway station, is designed around music —though its Ethiopian cuisine, along with some North American-style dishes prepared by namesake owner Hirut, is as much an attraction as any sonic delights. Hirut’s husband Tibebe, in fact, is a musician of some talent and the room’s dedicated stage with a street-window backdrop features good sound and soft, engaging lighting that creates a cozy, intimate atmosphere. That’ll definitely benefit Quarrington, whose verbal wordplay and intricate guitar stylings certainly deserve a room in which he can actually be heard, and it’s always a special (and too rare) occasion when he takes the spotlight to do his own material —so this is an inspired fit. Uncle Herb, as Dale’s friends and fans often call him (harkening back to his welcoming, relaxed open staging hosting over several years) can also be soft-spoken musically but also has some rollicking wit and wisdom in livelier tap-along tunes that easily become earworms. Buhot’s darker, musically dense and powerful original Grunge-Folk tunes, expressed on his debut United Truce album (there’s one track on our website at the Featured Tracks page on the Music tab) and to be featured on a new disc he’s presently recording, should command their own attention; but being performed in a room where people listen to the lyrics is something his songs deserve. Suggested cover, shared by the talent, is $10 but you won’t be turned away if you can only afford less than that.